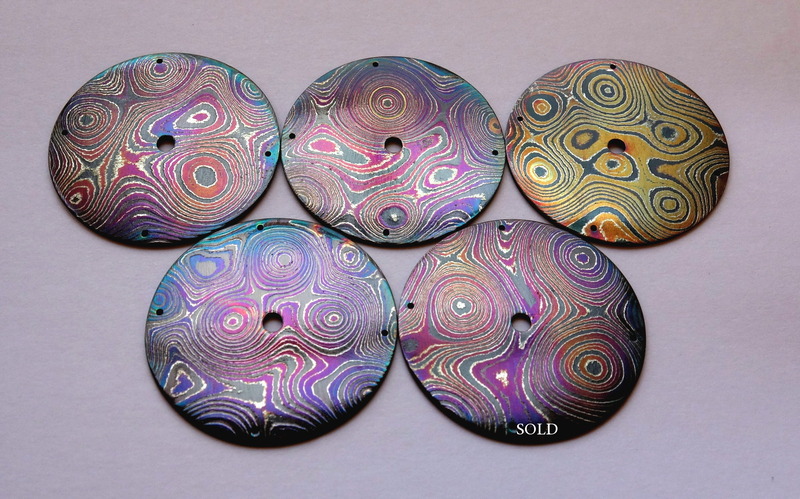 Damascus steel is generally thought of as being raw and unpolished. 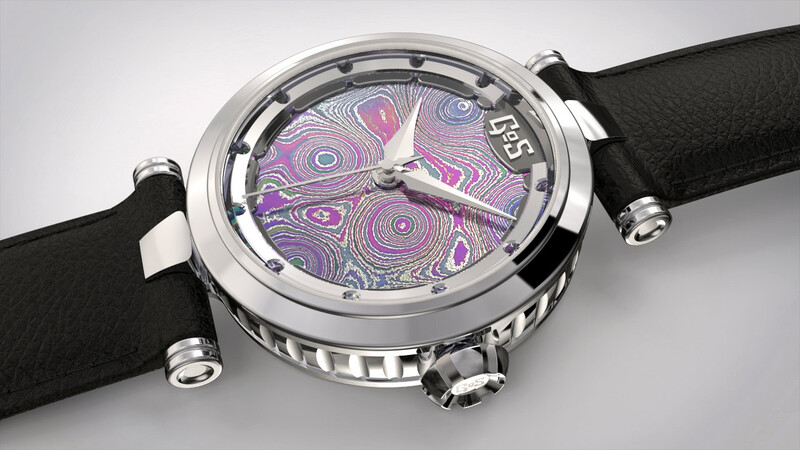 However, GoS has shown that it is possible to manufacture elegant and exclusive watches from our hand forged steel and we are proud to announce the first GoS ladies watch. 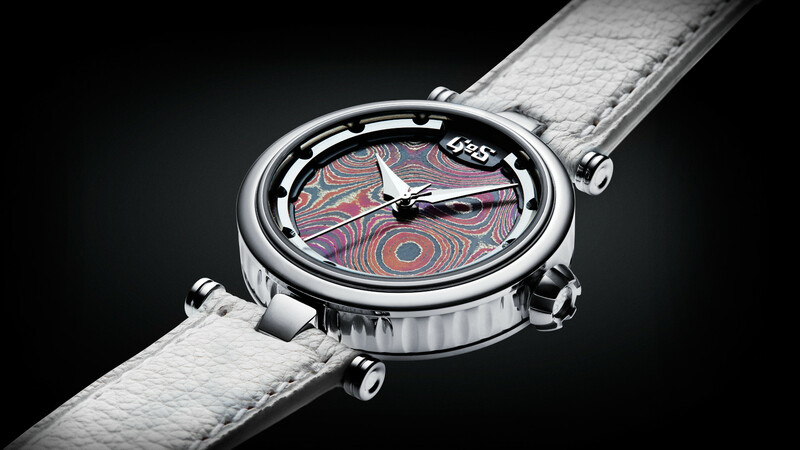 The Sarek Ladies is the first ever women's watch with a damascus steel dial. Johan Gustafsson has a unique ability to extract natural vibrant colors from his hand forged steel, which we use in the Sarek to the fullest. 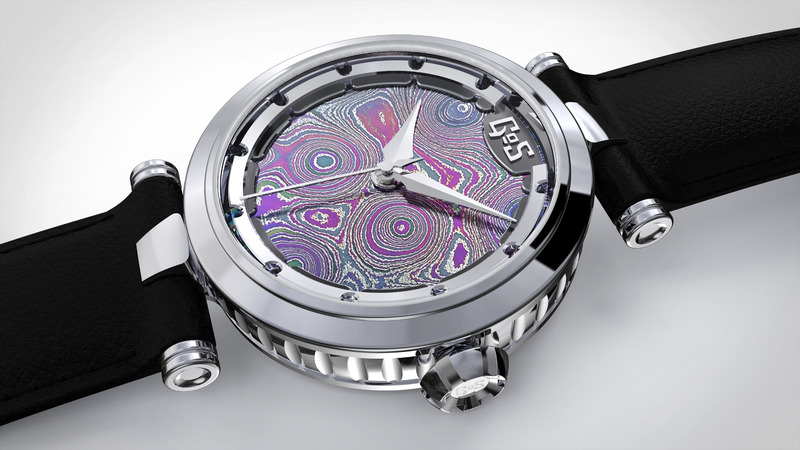 The idea of making watches based on a National Park was initiated and developed by Patrik Sjögren and Johan Gustafsson during the winter of 2015/2016 and introduced with a prototype of a Sarek men's watch during Baselworld 2016. 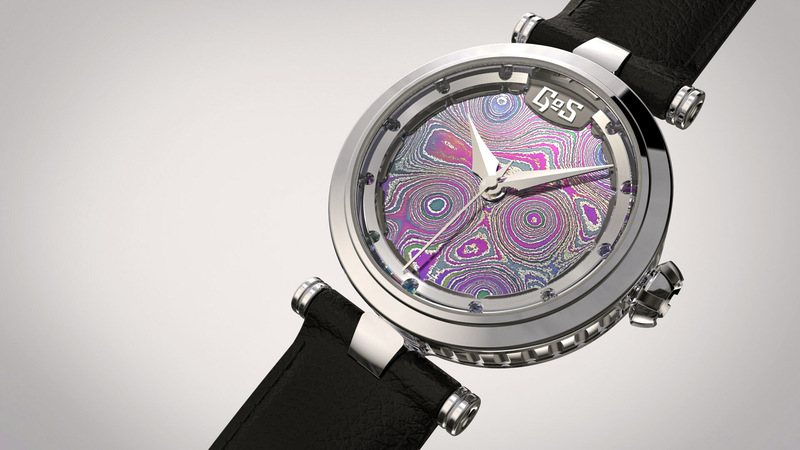 GoS then continued to develop the men's watch but also started to work on a ladies model. The ladies model shares some of the Viking inspired details that were introduced with the men's Sarek while adding new details such as the strap screws. 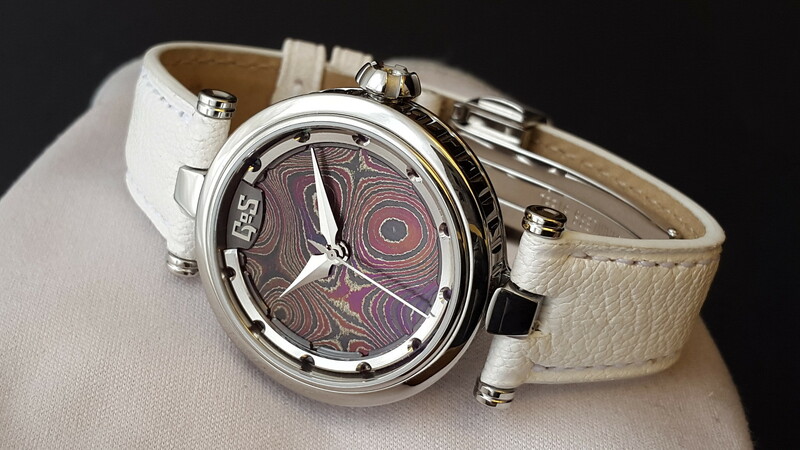 The elliptic grooves on the case ring which GoS premiered on the men´s Sarek have been made more elegant and the whole case is high gloss polished. Another striking difference us the index markers of Sarek Ladies, which opened to show the colored steel below. 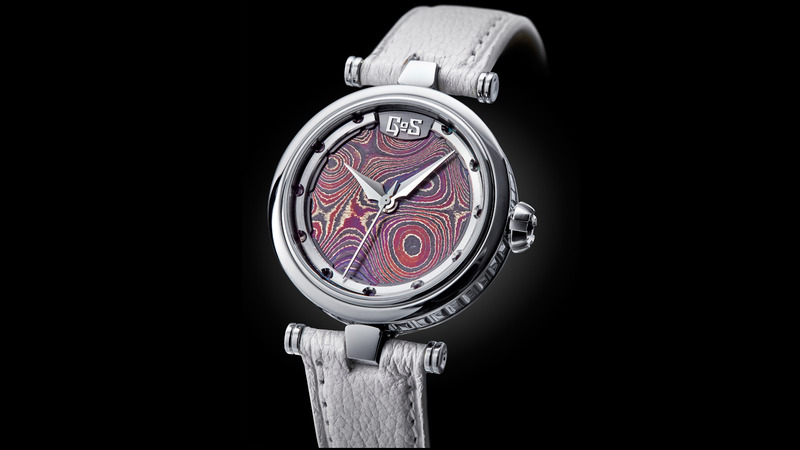 The slightly sloped case interior provides more light to the indexes and provides a surface on which the colored damascus steel is reflected. 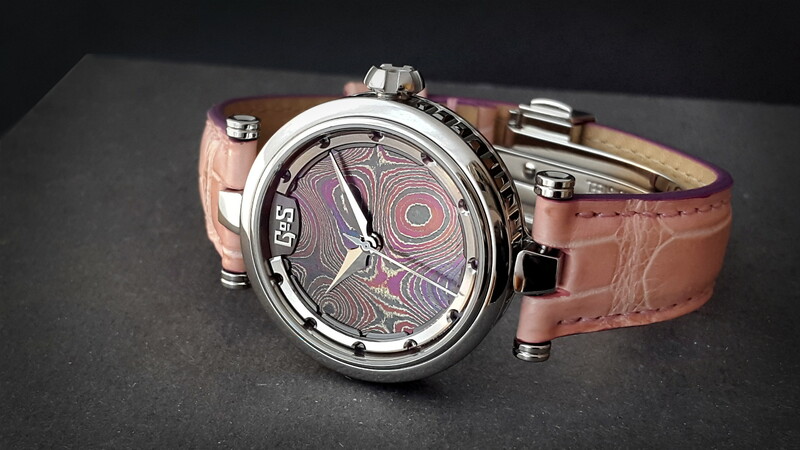 The patterns and tempered natural coloring of the Sarek damascus steel dials are inspired by the landscape of a valley in Sarek national park in Swedish Lapland. Sarek National Park is regarded as a Swedish national treasure and is often referred to as Europe's last true wilderness area. It hosts the largest Moose (Älg) in Europe and is also home to 100 glaciers and six of Sweden’s 13 highest peaks. The park is 2000 square kilometers of majestic and untouched wilderness and its remoteness is matched only by the breathtaking beauty of its peaks, valleys, and fast-running mountain rivers. The hands of the Sarek Ladies are high gloss polished in a Dauphine finish with a center ridge to emphasize our inspiration from Viking arrow and spear heads. Sarek is powered by a Soprod A10 movement, which is equipped with a custom GoS triskele rotor, finished in satinized dark grey with am additional rhodinized counter weight. The Sarek Ladies is available with black Sarek Moose leather strap or optional pastel colored straps in high-quality leather, all fitted with a stainless steel folding clasp. Shapes from Viking sword handles were the main source of inspiration when we designed the new GoS crown. The result is a unique crown that is highly ergonomic. 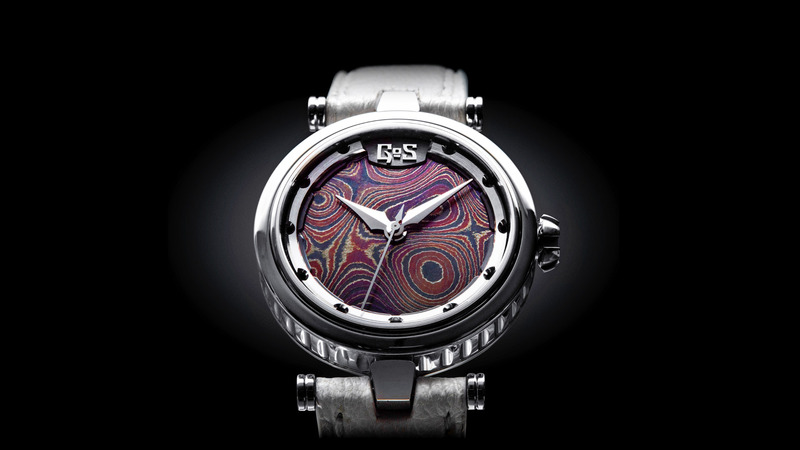 Dial: 164 layered steel Damascus steel with a Pool pattern. 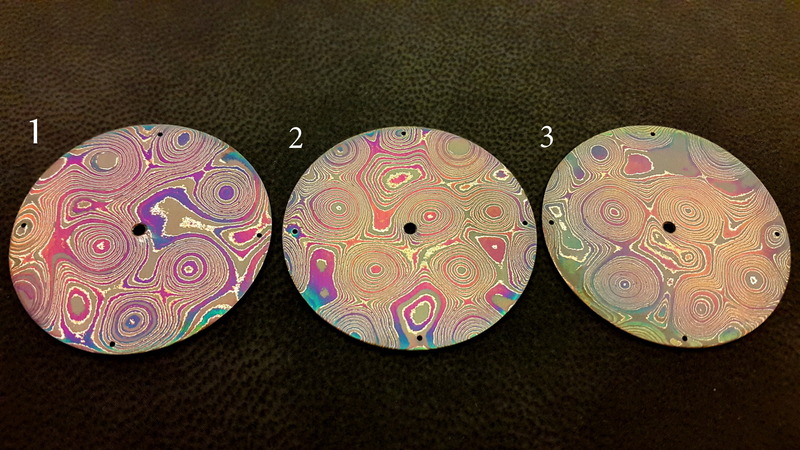 Tempered coloring of dial results in unique combinations for every dial. Index ring/rehaut: Two layers that combine previous GoS designs with inspiration from viking bracelets. 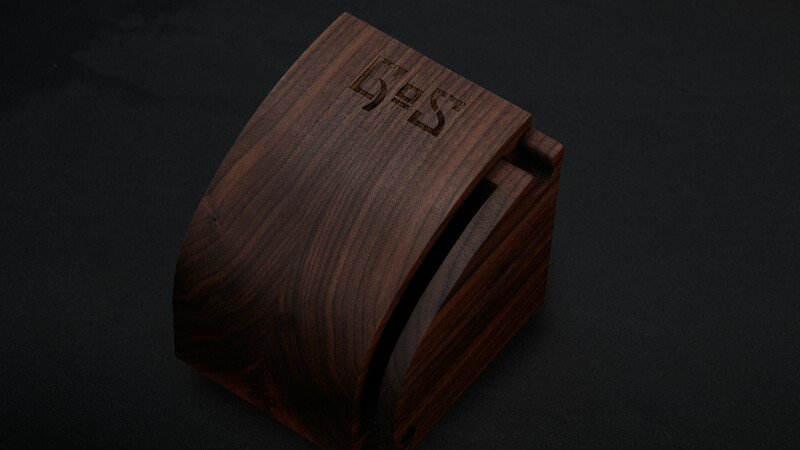 The polished GoS logo applied to the lower ring. Both rings with polished bevels and satinized top surface. Hands: GoS spear shape in high gloss polished Rhodinated finish. Crown: GoS design in highgloss polished with satinized grooves. It is 6.5mm in diameter and has double gaskets. 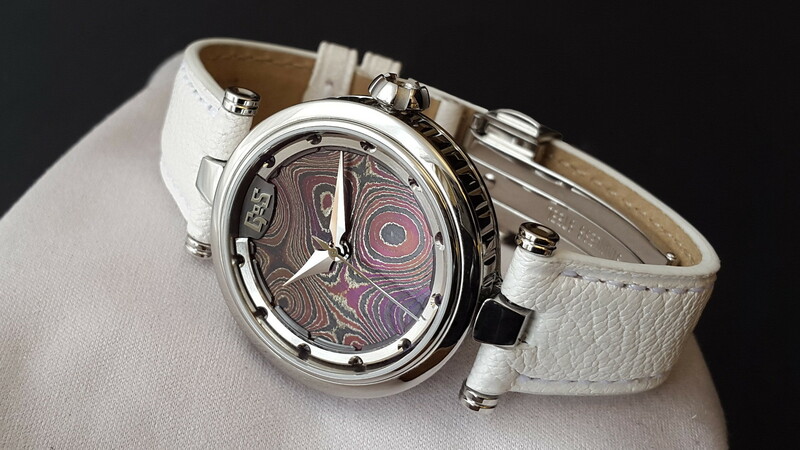 Case finishing: Stainless steel worked with inspiration from viking rings and then highgloss polished to provide lustre. Strap: 16-14mm in either black moose leather or pastel colored high quality leather with stainless steel GoS deployment buckle. 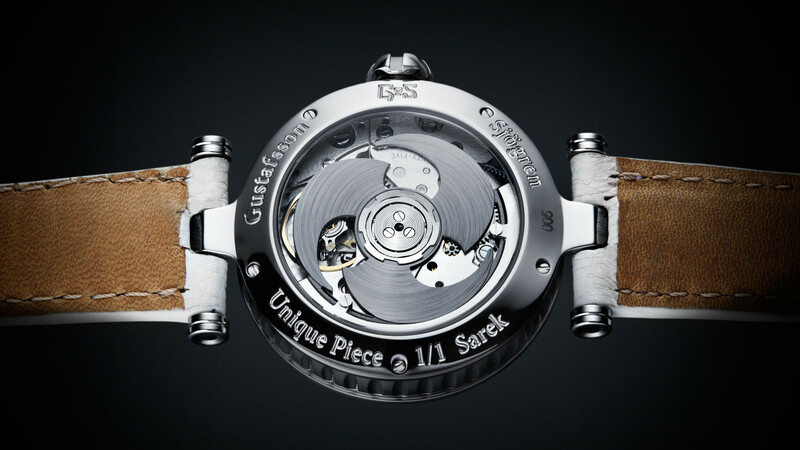 Every watch engraved with “Unique piece 1/1” and a serial number. 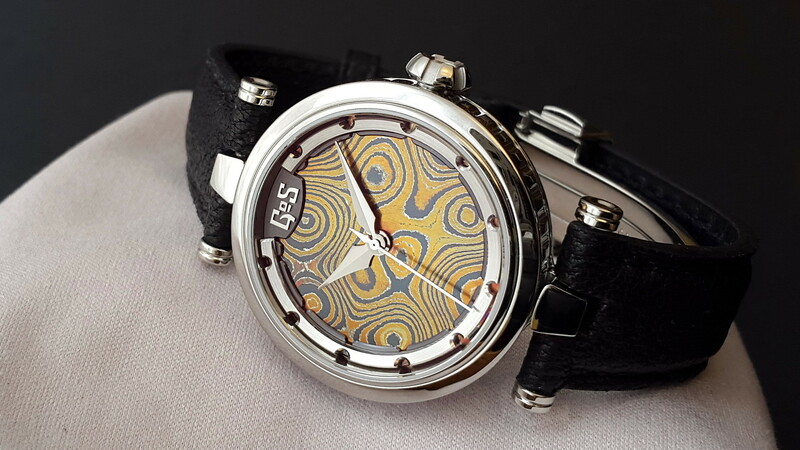 Like all GoS watches, every Sarek dial has a unique pattern and coloring but all will share with the same character. Clients can also request alternative colors and select from a choice of a minimum of two dials when ordering directly from GoS. The retail price is US$8,500 (+applicable taxes).